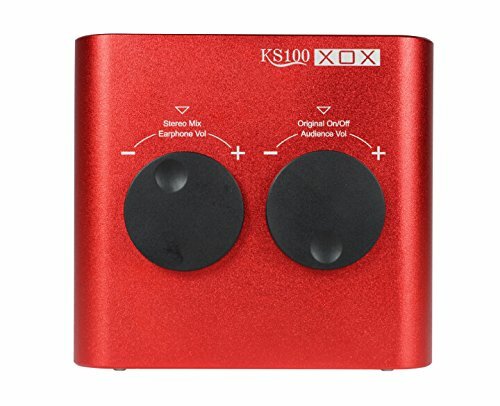 XOX KS100 Typical Use: For high-quality audio recording from an external microphone onto your computer. It can be used for singing, chatting, or doing overdubbing work. Additional Uses: Music enhancement and enjoyment, online game hosting, webinar / seminar announcing. This is also an excellent choice of external sound card for people who want to transfer or digitize recordings from another source onto their computer. Multiple microphone inputs which allows you to input professional microphones into your computer. With multiple MIC inputs, audio outputs and real-time effects, you could easily record almost anything onto your computer with studio-level quality. Description of Use: USB Sound Card and Audio Mixer which allows you to use professional microphones with your computer. This device allows you to mix and control the recording of the audio input into your computer when hosting webinars, singing, making speeches for promotional videos, playing electronic instruments, and much more. This USB Sound Card is the perfect microphone input control and enhancement device for people who do any kind of high quality audio recording onto their computer. Has professional microphone jack and multiple types of audio adjustment along with onboard hardware based DSP mixer and six types of reverb FX. It has many sound input uses for people who do audio recordings onto their computer. It can be used for recording conversations for podcasts, vocals for music, overdubbing onto videos, etc. It can be used at home or in any office and will increase the audio quality and strength of your sound recordings. If you have any questions about this product by Emperor of Gadgets, contact us by completing and submitting the form below. If you are looking for a specif part number, please include it with your message.